Simon & Schuster UK, 9781471135125, 448pp. A stunning Dr. Watson thriller from the bestselling author of Dead Man’s Land, The Dead Can Wait, and A Study in Murder. Autumn, 1917. London is not the city that Dr. John Watson and Sherlock Holmes once knew. Terror has come from the sky and Londoners are scurrying underground in fear. Then tragedy strikes Watson. An old friend, Nurse Jennings, is on a medical boat that’s torpedoed—with no survivors. And his concert-going companion, Sir Gilbert Hardy, is kidnapped. Then comes the gruesome ransom demand, for Sir Gilbert and four others, which will involve terrible mutilation unless the demands are met. Help comes from an unlikely source when Watson finds himself face-to-face with his old ruthless adversary, the “She Wolf” Miss Pillbody. 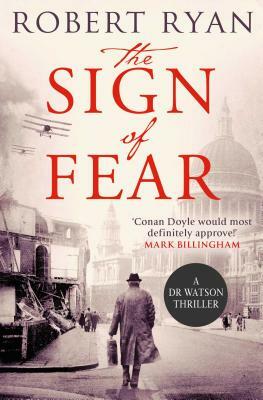 She makes him an offer he can’t refuse and so an unlikely partnership is formed—a detective duo which will eventually uncover a shocking case of murder and find Watson on board a German bomber, with a crew intent on setting London ablaze. Robert Ryan is an author, journalist and screenwriter who regularly contributes to GQ and the Sunday Times where he was Deputy Travel Editor for seven years. Ryan is currently working on his next novel and a variety of television projects. Find out more at RobTRyan.com and follow him on Twitter @robtryan.